During my first 1000 things project, one of the first things I discovered was the presence of inner voices: an internal dialogue between me and my things which I encountered whenever I dealt with them. I learned that these inner voices were the most subtle but perhaps also most powerful attachment, and so I learned to listen to them and try to understand what they were saying. Now that I’m well into my third and final 1000 things project, I’ve learned a deeper truth about them, which is this: The inner voices don’t go away. Not for me, at least. You might think that, after having gotten rid of so many things, I would have learned to manage the inner voices better or subdue them more effectively. But no. If anything, they are at least as loud as ever. This phenomenon in itself is not new; I had previously noticed that my inner voices were stronger and more insistent when I dealt with things that had deeper attachments to me. But I’m finding that it’s more common now, probably because I’ve gotten rid of most of the easy things to get rid of, and the ones that remain have a stronger claim on me. In particular, mementos require more attention and more difficult decisions. I’d already started this process in the 2nd thousand things project with many of my own mementos; I’ve disassembled trophies (e.g., #1750, 1774-75), thrown out moldy baseball caps (#1682-86), and disposed of a lot of old school papers (e.g. #1697-98, 1804-05). This process has continued in the third 1000 things project with certificates (e.g., #2042), art work (e.g., #2043 below), and high school handbooks (#2051, 2052). The process involved a fair amount of time discovering, reminiscing, and deciding, and parting was sometimes not that easy. I expect it will be even more difficult when I go through other remaining mementos such as photographs, some of my son’s stuff, and some of Martha’s remaining stuff. 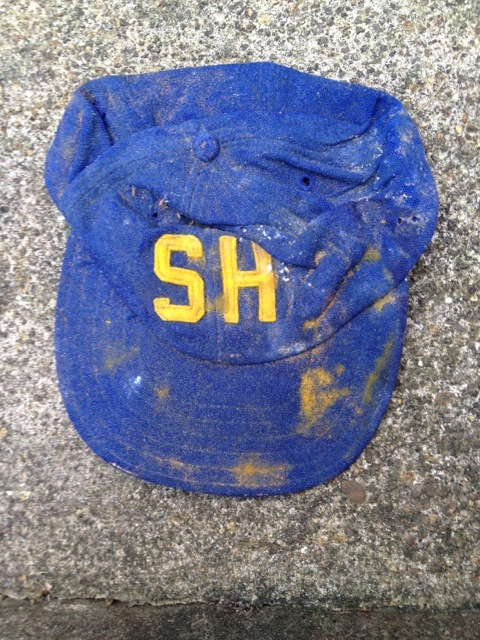 In some cases, encountering these objects evoked instant strong memories of something I may have remembered now and then over the years, for instance Little League and Teener League baseball team pictures (#1836, which was a bit moldy; I have kept the others for now). In other cases, the memento evoked a long-forgotten memory, for example the faux stained glass X-mas tree I made out of tissue paper in third grade (#1820). (For me, third grade seemed to be a big art year.) In still other cases, I had no recollection of the object, and seeing it did not evoke any memory for me, for instance a letter I wrote to my mom in second grade (#1830) asking her to make sure I got enough sleep so that I could do well on exams the next day. There were also some new inner voices, or at least some which I had not paid any attention to previously. For instance, I recently got rid of some comic books. Most of them were in decent shape but certainly not in mint condition; they’re mainly Archie, Jughead comics from the 1960s (only 12 cents!). I listened to the inner voices and followed their guidance for awhile. They could be worth something. Maybe one of them could be worth a lot of money. So I looked on eBay — eh, not so much. Maybe someone else will value them. So I visited a local comic book store while out doing some errands nearby (I’ve learned from the previous projects that they weren’t worth a separate trip!). Not interested; ‘try this other local store, or there’s a place in Waldorf’… So I called the local store; not interested either, ‘but there’s a place in Falls Church that might take them; or there are a couple of places online…’ Falls Church? Waldorf?? Online? Now we’re talking entirely too much time and effort; if two comic book stores won’t take them, then maybe I should just — Still, It would be a shame just to throw them out. The inner voices are strong and insistent. So I went on Freecycle — any comic book collectors out there? Turns out there were plenty who were interested in them, and they found a good home, with my efforts producing a little more gratitude in the world in the process. Two weekends ago, I finished my 2nd 1000 things project with a flurry by taking almost 100 items to Goodwill, which was possible since I had assembled them in staging nests over a period of time. The 2nd 1000 things project was more of a journey of recognition — rediscovering, recognizing, and getting to know better the themes I had discovered on the first go-round: inner voices, stories, attachments, curation, gratitude, completing the cycle. The 2nd 1000 things project was also to some extent an initial attempt to apply what I learned in the first go-round to the second round. In retrospect, I don’t feel that I was very systematic about it or did this as much as I’d planned. Maybe this is in part because I was documenting the first project while also doing the second, so I may have crossed my wires more than I realized at the time. I also attempted to learn more and get better at the process. I read several other books about decluttering, focusing on the sub-genre of books that focused on decluttering as a form of life improvement, because I felt that my journey was most like those, as distinct from being a set of projects focused on being more organized or minimalist. I also made more of an effort to elicit and harvest stories from others. Hearing other people’s stories has been very helpful and gratifying. Even though my own journey feels at times so individual and unique that it borders on idiosyncrasy, hearing other people’s stories makes has made me realize that dealing with our stuff is both an individual and universal experience. I continue to be impressed by how amazing my own stories are, and how even more amazing other people’s stories are. Dealing with our stuff really is, or can be, a touchstone experience — something that so many people can relate to, finding commonalities and uniqueness coexisting side by side. The volume of papers and items in my home office has diminished greatly. In fact, I can say that my home office is almost under control, if not exactly tidy. (I’m not really the tidy sort.) 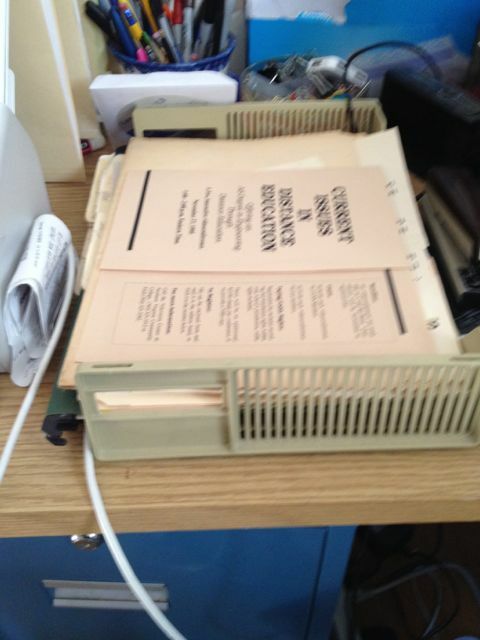 One small file cabinet is entirely empty, as is one drawer of a second file cabinet. All the extra bins are gone, as are the stacks of papers from the storage carts. Tops of surfaces are almost clear. There are actual spaces on my bookshelf, even after I moved some of Chris’s books from his bedroom bookshelf to here for consolidation purposes. The dining room is noticeably clearer. A lot of culling has taken place in the kitchen, dining room, backyard shed, porch, basement, and all the closets. I got rid of about 100 things at a time twice during this project, thanks to a strategy of gradual collecting decent but less valued items over a period of a few weeks and then hauling them off en masse to Goodwill, as described in my previous post. Several nests are completely gone in the basement and dining room. The “staging nest” by the front door has been emptied several times and doesn’t have a whole lot of stuff in it right now. Even though things still sometimes sat in my front door staging nest for months at a time, I definitely got better at dealing with them, especially once I become comfortable with utilizing Goodwill. Seeking opportunities to create gratitude, focused on others but usually generated gratitude within myself. I especially got better at completing the cycle — about being very careful about what I took in to my home. It feels as if I have installed a radar system that’s pretty effective overall at keeping unwanted or unneeded objects out of my home. There are a few notable exceptions, which will make an interesting future blog post in and of itself, mainly due to the fact that I can probably identify almost every new object I’ve brought into my home over the past nine months, which in itself is an indicator of my success in this area. I’ll write more about the specifics of these in future posts. I still can’t really see whether my end goal of living in a dwelling where everything I own has identifiable purpose or value is in sight, but I do feel as if it is getting closer and maybe within reach. Overall, though, I feel that it was well worth it. Decluttering tips in action: I’m long past the “low hanging fruit” stage, but emptying this outbox (which can sometimes take me 2-3 hours depending on how full it is) utilizes a mix of categorical (papers, mementos) and spatial (office, papers from storage bins in basement) strategies — and yes, the process of emptying this outbox is definitely therapeutic for me! Recently, someone who was planning a possible move in the not-too-distant future asked me for advice about how to get rid of enough things to be ready for this move if it happens. I was reluctant at first to provide advice because that has never been the intention of my own 1000 things projects. My writings about the projects are meant to be descriptive, and I don’t want them to end up as prescriptions for how others should do their own journeys. But, since I was asked for advice, here are some of the ideas I shared about how I would proceed under her circumstances based on my recent experience and stories from others. – Go for the low hanging fruit first — In effect, this is the first stage in the culling process: pick out the obvious stuff first. 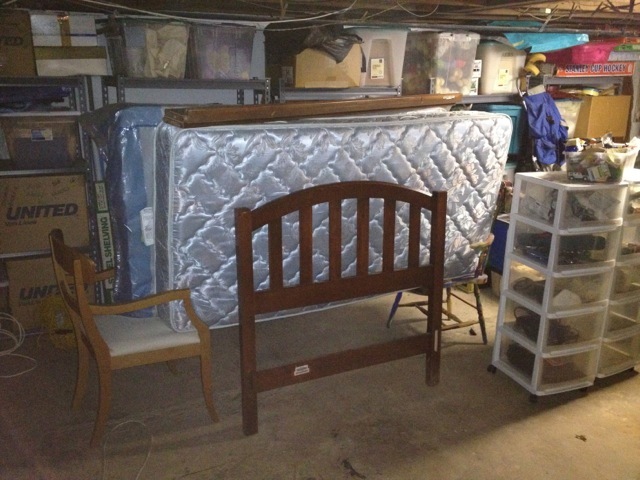 For someone who’s planning to move, the most likely pivotal question is, “do I want to move this or not?” In this particular situation, this person wants to keep some things but not necessarily move them right away, so the process may involve deciding what to keep, what to pitch, and what to put in temporary storage. I’ve had other people tell me that when they’ve done this and gone back to their storage, they realized that the things they kept in storage they really didn’t need after all. If you go this route, your experience may be similar — or different. – Mix spatial and categorical strategies, that is, go back and forth between spatial areas (for example, a corner of a room, a closet, a shelf of boxes, a file cabinet drawer) and categories (books, clothes, mementos, etc.) when selecting where to declutter next. I’m not a big fan of using just one of these strategies exclusively; it didn’t work for me when I tried it, and I liked the variety of going back and forth between areas and categories. One possible drawback of this mixed approach is that it’s harder to get that feeling of progress from noticeably altering a spatial or categorical area more quickly. So I used the counting of items I got rid of to get that sense of progress instead. Your experience might be very different if you’re in a greater hurry, though. In that case, you might find it more effective to cull the low hanging fruit by space, for instance selecting the obvious items to get rid of first in a room or closet or section of the house, or by category, for instance by identifying pieces of furniture or clothing that you want to get rid of first. – Do your decluttering in two- to three-hour segments, or sprints — I got this idea from reading the book SHED Your Stuff, Change Your Life (my review of the book is here), and I’ve found it works well as a guideline. I should say up front that I am generally incapable of following a rule like this for an extended period of time. For example, I will use the Pomodoro technique (25 minutes on task, five-minute break) now and then to structure a stretch of tasks during my workday, but I can almost never do more than two or three of these at a stretch, and sometimes I can only do one. So while I say that doing your decluttering in two- to three-hour segments is an effective strategy, that doesn’t mean I do it very well. So what does that tell you? Perhaps it tells you to try something and then adapt it to your needs. I will say that I’ve been able to use the idea of “sprints” effectively. This idea comes from the world of software development and refers to a set period of time of focused work on a project, often with the goal of completing a specific set of work. The key elements are focus, time boundaries, and (to a lesser extent for me) some sort of goal. I tend to set a numerical goal such as getting rid of x number of things (or preparing x number of things for ‘disposal’) within a time period. Someone who’s trying to move more quickly might find a spatial focus to be more effective here, for instance clearing out one file drawer or a closet or a corner of a room. – Use decluttering as therapy — This idea comes from a friend of mine who recently described to me how she spent a few hours cleaning out a closet in her home that was bothering her. The process made her feel much better when she was done; in fact, she described it as therapy. Hearing this story was an ‘aha’ moment for me: decluttering can be great therapy! I took her idea and ran with it a little bit more — imagine your home as being, in effect, a collection of therapy sessions-in-waiting: convenient (do them at a time of your choosing), effective (that feeling of release when you see a space that is clutter-free, organized, liberated even), and, perhaps best of all, free! No need to spend $175-200 on formal therapy when you can create your own therapy session; all it requires is your time and attention. I’ll think about the Amazon worker story not because this is a story about horrible working conditions or outrageous exploitation or even moral clarity. The appropriate response is not immediately clear to me: do I stop shopping at Amazon and exhort others to do the same out of righteous moral indignation? Somehow, I find it easy to imagine a large group of warehouse workers who would exhort me NOT to do that. They would say that having their job may be a “precarious existence” but is still better than nothing; like Jeff, they would believe that they have at least a foothold on a path up, even if they literally die trying. On my next trip, I made a point to pay attention to how much I spent for my lunch…I didn’t do anything with this information that day. I just noticed it and found it interesting… [an] outward focus on tips and tricks to control our spending might be important, but what is far more important is the inner work we can do by paying attention to what we do with our money… I just noticed what I was doing with my money and, for me, things changed. Thoughtless consumerism (for lack of a better term; feel free to suggest one!) is a similarly ambiguous situation. Thoughtlessness can be a good thing; indeed, as individuals and as a society, we utterly depend on it. I’ve sat here typing these last 400+ words without giving a single thought to the multitudes of people who have made it possible — designers, manufacturers, transporters, salespeople, and others who have brought me my computer and the desk it sits on and the chair I sit in and the clothes I wear — including, quite possibly, someone like Jeff who snatched one or more of these items off a shelf in some faraway warehouse. The issues, as usual, are boundary issues: when does thoughtlessness become harmful, even toxic? In my case, I have the luxury of not having to be particularly watchful about my spending, which makes it even easier to be thoughtless. But my 1000 things projects experiences have taught me that being thoughtless about my consuming has its perils. The NYT article offers an antidote which I’ve found helpful: the simple act of noticing does change things; it is the root of a solution. So, the next time I go to Amazon to reflexively save a few bucks on a purchase, first I will pay attention. I’m not sure what I’ll think next: will I decide to purchase somewhere else? Will I decide not to buy anything at all? Will I come to some clearer sense of how my actions affect a few people working in an obscure fulfillment center? Will I decide to try to make a purchase that I think will somehow be a healthier one for those whose job it is to fulfill my purchase? I don’t know yet — partly because paying attention also opens the door to a potentially exhausting complexity of decisions. One example: my last online purchase was some bath towels from Bed, Bath, and Beyond. I deliberately chose them instead of Amazon because they had a better selection and because it was not Amazon. I briefly had a passing thought of moral superiority because I forewent choosing Amazon. But now that I’m paying attention to that purchase retrospectively, I realize the foolishness of that thought: just because I’ve heard bad things about Amazon’s fulfillment practices doesn’t mean that BB&B’s are any better. Lots of good advice and tips (five stars); don’t be scared off by its extremes — worth the read overall (four stars). 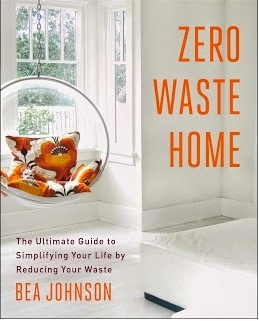 Of the five books I read this summer, Zero Waste Home: The Ultimate Guide to Simplifying Your Life by Reducing Your Waste by Bea Johnson is by far the most extreme. How extreme? Imagine a family of four generating only a quart of garbage — every year. Obviously, getting to this level of waste reduction takes us far beyond simple decluttering, and as the subtitle implies, the Zero Waste Home approach places its primary emphasis on the intake side of your stuff. Although Johnson notes early on that the book “will encourage you to declutter,” her eyes are clearly on bigger prizes: “a better environment” and “a better you” [Kindle location 170]. The path for doing this is by “understanding the effect of our purchasing power on the environment and acting accordingly” . In this context, decluttering is about not just getting rid of stuff, but learning how to refrain from collecting stuff in the first place. While Zero Waste Home does not have a method for decluttering, Johnson did have a motto which she and her family applied when they downsized to a much smaller house: “What we did not truly use, need, and love had to go” . Using this motto, the author’s family reportedly got rid of 80 percent of their belongings within two years. Zero Waste Home certainly delivers on its promise to “take you beyond the typical eco-friendly alternatives covered well in other publications” . For starters, the book takes the “reduce, reuse, recycle” mantra one step further at each end, by adding refusing (what we do not need) as the best option and rotting (composting) as the option of final resort. But getting to Zero Waste in today’s society is another matter altogether; indeed, Johnson describes Zero Waste as “an idealistic goal, a carrot to get as close as possible”  and notes that “this is not a book about achieving absolute Zero Waste,”  which is not possible because of current manufacturing practices in place. The author should know: as first she tried to do things that even she found to be too extreme — churning her own butter, making her own lip balm, even foraging for moss to use instead of toilet paper , before she backed off in order to find some balance. Even so, her family’s resulting “balance” is quite extreme for most people: using kitchen towels for sandwich bags instead of plastic ones , using cloth bags to buy all your produce and bulk items [862-66], or taking your bread home from a bakery in a pillowcase , to name just a few. Fortunately, you don’t have to go to such extremes to derive value from the book. In fact, this book generated the largest number of useful tips (almost 20 of them, to be exact) of any of the books I read on decluttering. Perhaps this is because at this point I am as interested in reducing my intake of stuff as I am of getting rid of it. Some of the things I’ve already done (for instance, using microfiber cloths to replace paper towels; creating a reuse paper bin for printing on both sides; asking family members which of them wants my Kitchen Aid mixer which I never use). Although the book is chock full of tips for reducing clutter (the word (de)clutter and its variants appear over 60 times in the book’s narrative), a lot of the book’s tips are about avoiding the creation of additional clutter by refusing to accept stuff, for instance by thinking twice before letting anything new into your house  or considering the life cycle and choosing only products you can reuse or recycle . Again, most people would find such tips to be onerous as a unremitting regime, but they can also be handy tools to have in one’s decluttering toolbox. Happily, Zero Waste Home also includes useful sections to help with systematically reducing the clutter in various areas of your house and life, for instance getting rid of kitchen gadgets and specialty items that are not worth the space [612-636], having a carefully selected small “capsule wardrobe”  which emphasizes style and quality over fashion and quantity, and tackling the formidable nests that are bathroom cabinets . – Is it in working condition? Is it outdated or expired? – Do I use it regularly? – Is it a duplicate? – Does it put my family’s health in danger? – Do I keep it out of guilt? – Do I keep it because society tells me that I need one (“everyone has one”)? – Does it truly save time, as promised? – Could something else achieve the same task? – Is it worth my precious time dusting and cleaning? – Could I use this space for something else? I like that this list of questions is a menu rather than a checklist; the questions are varied enough so that I can pick and choose which ones are appropriate to ask for a given item rather than feeling like I’m supposed to ask each question of every item (which is a non-starter for me). This makes the list another set of handy tools to use in the decluttering process, particularly for dealing with difficult or sticky decisions about individual objects. These takeaways are important because at times, the book’s single-minded focus on getting as close to Zero Waste as possible seems more fanatic than sensible. Even though Johnson says early in the book that “how much waste one generates is not important” and that “everyone can adopt the changes that are possible in their life” , Zero Waste Home also spends a fair amount of time prescribing correct behavior. For instance, “shopping should always start” with buying used items, preferably at thrift stores, garage sales, or online sites such as Amazon and Craiglist . Such prescriptions at times lead to rather unhelpful assertions; for example, saying that “stuff takes us away from our roots, from the outdoors”  is only part of the story, and disposables  are not pure evil but in fact can save time and offer convenience, which is a different kind of freedom from making our own stuff. Zero Waste Home‘s emphasis on avoiding packaging at all costs sometimes leads to rather absurd concessions, as when Johnson advises readers to refill a beer jug at a local brewery but notes that this method requires being ready to drink a gallon of beer at once before the beer loses its carbonation; her solution to “have some friends over”  is a pretty weak and unreliable one. In the end, Zero Waste Home amply demonstrates its premise (whether intentionally or not) that Zero Waste is an “idealistic goal” which requires going to extremes that most people won’t accept, including me. Even so, you can find value in this book without having to embrace its extremes, especially its many useful resources on decluttering both as a process of getting rid of things and as a process of refusing to take them in. Even adopting just a few of the book’s suggestions will help you move the needle toward building a healthier relationship with your stuff. Still more good advice and tips (five stars); spiritual approach with limited appeal (three stars); worth the read overall (four stars). Breathing Room: Open Your Heart by Decluttering Your Home by Melva Green, Lauren Rosenfeld is yet another variation on the theme of using the decluttering process to change your life: in this case, decluttering as “a spiritual process that involves coming into communion with what is truly important” [Kindle location 96]. Here’s the deal, and it’s pretty darned simple: Whether the clutter is in your home, heart, mind, or spirit; if it’s weighing you down, crowding you out, blocking your light, cramping your style; if it’s become an obstacle you keep stumbling over; if it continually cuts you with a broken, jagged edge; if it’s stopping you from finding the things you really love, then it’s time for you to let it go . The authors’ “honest truth” is that “you only have room and time for what you truly love,  hence the need “for you to make some space for what truly matters. It’s time you found a little breathing room” . It’s important to understand that this definition of clutter is distinctly different from what you or I might have in mind. By Breathing Room’s definition, a cluttered desk or nest of things in a closet is not really clutter if it’s not getting in your way; conversely, a single object could be clutter if it’s “cramping your style” or “weighing you down.” In effect, defining your things (or your emotions or thoughts for that matter) as clutter depends more or less entirely on their effect on you. In this context, it’s not surprising that Breathing Room makes large, outsized claims about the stakes and potential benefits of the decluttering process. Green and Rosenfeld assert that “decluttering is a deep spiritual practice that can bring you closer to your true self, the people you love, and your Divine Source” . In their view, one’s clutter is hiding “spiritual lessons and emotional ah-has” which are there waiting to help you liberate your home and your heart, “give flight to your spirit and rock your world” . Perhaps this is because the authors’ experiences were based on their work with extreme cases (co-author Green was a consultant on the TV show Hoarders), I found myself wondering if the primary audience for this book is serious hoarders, for which the heavy spiritual emphasis is an antidote; extreme problems demand extreme solutions. Although Breathing Room recognizes that the decluttering process is a “complex” and “personal” journey and that “only you know how to make that journey safe and comfortable” [149-153], this happens in the context of its “spiritual method of decluttering” which is called SLICE, an acronym for “Stop and Listen. Intend. Clear the Energy” . The method itself is demanding — the first step (Stop and Listen) asks no less of you than to “change your habits of being”  — and for me it goes off track by reading too much into our clutter, which for them represents “our history, fears, worries, and uncomfortable and painful emotions” . Indeed, the authors assert that our emotions “tend to generate clutter”  that “blocks our hearts” . The solution to all this is to use decluttering to create empty spaces, which are “full of pure potential, a vast openness into which we can invite any energy we desire” . This does not match my experience with the 1000 things project. For instance, Breathing Room’s assertion that “we create our clutter unconsciously, through indecision, fear, and running away” is rather naive if you ask me; our consumerist society which encourages us to accumulate things thoughtlessly has a major role to play in this too. The authors also seem to uncritically criticize all “time-saving” devices that in fact “are not only consuming physical space and time, but they are also taking up mental and emotional energy” . There is an element of truth to this in many cases, but I still happen to think a blender is quite handy, thank you. As a result, I found Breathing Room’s approach to be foreign for my own purposes for the most part. For me, decluttering can be a deep spiritual practice, or it can be something more mundane than that. The 1000 things project aims to support self-directed journeys rather than directly aiming for life-changing experiences, so a 1000 things project can be far less ambitious than aiming to serve one’s “Highest Self” , for instance. Likewise, in my experience decluttering doesn’t have to revolve around “love” or “joy.” Although Breathing Room offers a somewhat broader list of choices as did SHED Your Stuff and Letting Go — “happiness, freedom, joy, ease, or love” , this is not a complete list either; for instance, there is more to purpose than “ease” — things like security, safety, comfort, utility, giving, and lots of other positive things as well. reminds me of the inner voices I encountered in my 1000 things project, and their description was more involved than what I encountered, so I’ve started listening more closely during my second 1000 things project currently in progress. The notion that “our lives are overburdened by physical reflections of our emotional exhaustion”  could be another useful insight in moderation (vs. as the basis for an entire method or process). The notion of decluttering as relief and release is another appealing concept for me moving forward. Who knows, maybe I haven’t reached this deep a spiritual level yet, and this serious level of a journey still awaits me. But I suspect not; so far I’ve been satisfied with where my own 1000 things project journeys have taken me. Breathing Room looks like an excellent resource for someone who is in dire straits relative to their relationship with their things, or for someone who wants their decluttering process to be a deep spiritual journey. If that description doesn’t fit you, you’ll most likely find a more simpatico approach elsewhere. More good advice and tips (five stars); overly prescriptive method (one and a half stars); worth the read overall (four stars). 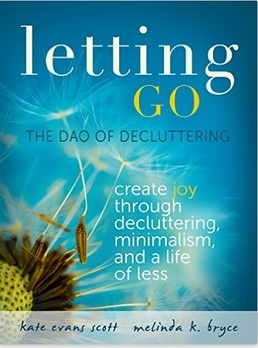 Letting Go: The Dao of Decluttering: Create Joy through Decluttering, Minimalism, And a Life of Less by Kate Evans Scott and Melinda K. Bryce is another book which claims to have “the most effective process for decluttering your home,” a process based on “Joy and Purpose” [Kindle location 150]. As its subtitle implies, Letting Go combines two distinct decluttering sub-genres: minimalism and life improvement. At least in my experience, the more severe proponents of a minimalist lifestyle (relative to one’s material possessions) advocate for their approach because it’s the Right Thing To Do: Save the Planet, maintain one’s personal purity, and the like. Less austere proponents tout the personal benefits of a “life with less:” satisfaction, happiness, and other good things. Letting Go falls in this camp and takes it a step further: decluttering, minimalism, and a life of less will create Joy (yes, capital J) in your life, which is as much of a need as “food, water, shelter, sleep, safety, and security” . It’s worth pointing out that this was the third of five books on decluttering which I read this summer. So by this time, my reading goals had evolved: I was looking new tips and ideas, as well as examples which confirmed what I learned from my ‘1000 things project.’ I never had any interest in following someone’s else method, so by the time I read Letting Go, my patience for prescription was wearing even thinner, and Letting Go lays on the prescription rather thickly — at least as strong as Tidying Up and much worse than SHED Your Stuff. It doesn’t take long for Letting Go to start telling you how to live your life, with an Rx that could have ‘clean your home, cleanse yourself’ on the label. For instance, there’s the assertion that “Your home should be your sanctuary from the hustle and bustle of the outside world. When you walk through your front doors, it should feel like a cleansing breath” . Likewise, “Mindful decluttering is a cleansing process. Once you have cleansed away the superfluous items” , you won’t need to worry about organization. Authors Scott and Bryce tell you what your goal should be instead: organizing? No… “That is not your goal. Your goal is to free yourself of the negative energy surrounding you” . Thus it’s no surprise that Letting Go is similarly prescriptive about smaller decisions as well, such as the number of paper items from your child’s life to keep (a dozen per year is “practical” ) or the number of blankets to have (one; you’ll take better care of it, be more grateful and attract positive energy ). As with Tidying Up, Scott and Bryce also believe that “it is much more effective to clear clutter by category” , that the things you discard can find a New Life , and they also display occasional OCD tendencies such as the prescription to have color-coded place settings for each family member . Despite its prescriptive tone, Letting Go confirmed some of the insights I gained from my 1000 things project and also offered new tips and advice that resonated with me. Among the insights that echoed my experience were the authors’ observation that clutter which fills your house drains both your physical and mental space . Letting Go also advocates curating your things by taking valued objects out of storage and putting them on display and treating them like prized possessions which honors the memories themselves [644, 666]. The authors also recommend photographing childhood mementos and creating a scrapbook to help let go of the physical version . The dual goals of Joy and Purpose  echo my goals of identifiable purpose or value, although I tend to use a broader range of criteria, for instance comfort and satisfaction among others. Letting Go also asserts the importance of gratitude, although it places more emphasis on generating self-gratitude  rather than receiving gratitude from others. Even though I don’t believe that decluttering by category is always the most effective method, I do like that Letting Go has more categories for things than Tidying Up, which makes the method a bit easier to tackle. Although the notion of letting clothes “find a New Life with someone” else is a little woo-woo for my liking, it did help inspire me to do another culling of my clothing with this idea in mind. If it was a popular name brand, you might have had to work five hours or more for that dress…What better activities could you have done with that five hours? Although I believe that the notion of a maximized alternative is a fallacy — we most likely would have spent that time working or loafing or something else less than maximal — I do like the idea of considering how much time and effort we embed into our things, and whether we our energies would be better expended or served in some other way. Letting Go follows a common trend of advocating for “experiences” rather than gifts ; in my opinion, this is also too pat of a response (many experiences require considerable time, resources, or expense), shifting from things to experiences, as well as the idea of purchasing many fewer, higher quality, more valued things, are both useful strategies for building a healthier relationship with our things. And while I’m not willing to go as far as Letting Go does (as do SHED Your Stuff and Tidying Up) by asserting that clearing the clutter in your physical space will automatically bring you joy, reset your life , or clear your mind so much that “you may be able to finally focus on that dream of starting your own business, or you could become more focused on your studies” , such things can and do happen sometimes, whether you choose to embrace the authors’ prescriptions or not. At the very least, Letting Go does offer useful tips for you to pick and choose as you engage in your own decluttering journey.